HomeWalker’s Latest Controversy with Native American Community Members: How Will it Embrace the Moment? Walker’s Latest Controversy with Native American Community Members: How Will it Embrace the Moment? 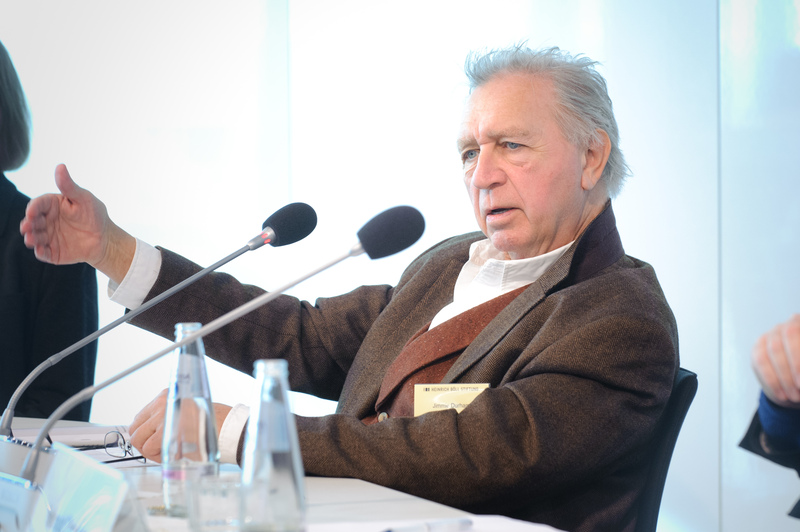 Jimmie Durham (Visual Artist, Berlin/Rome) Wikimedia Commons. The Walker Art Center is once again getting questioned about its ability, or inability, to engage with Native artists and Native communities. Issues of identity and “who is Indian” raise thorny questions. It’s easy to get sidelined in those questions and ignore the bigger one. The issue here is the same as with Scaffold. Does the Walker have inclusive and representative staffing in place — and the ability to listen to Native voices and collaborate with Native artists on these issues? I am less interested in whether or not Durham is Cherokee as I am with how the Walker engages in the conversation about whether or not Durham is Cherokee — including various Native perspectives on that question. Will the Walker seize this moment for a more robust engagement with Native artists, elders, and communities? Will it continue to engage after the Durham exhibit leaves, or will the conversation disappear like invisible ink? Earlier this year, the Walker was trying to figure out how to address the controversy around Scaffold, a newly acquired piece for the Sculpture Garden. A commentary on capital punishment, Scaffold prominently featured a replica of the gallows used to hang 38 Dakota men following the 1862 Dakota-U.S. War. Sam Durant, a white artist, created the work. It drew strong criticism from the Dakota community and elders. The work represented perhaps the worst day in their history and they had no involvement in the process. The Walker began conversations with Dakota leaders; at their request, it removed the sculpture. The Durham retrospective was organized by the Hammer Museum in Los Angeles. The Walker is its second stop. Some Minnesota-based Native artists approached the Walker last year with concerns about the Durham show. One was choreographer Rosy Simas, who has presented work at the Walker. She is Seneka. She says there are very few visual arts shows by Native artists at the Walker. “It has always been very heartbreaking to never see myself reflected in the work there,” she said. What if any follow up happened after last year’s meeting with Simas (and other artists)? What if anything will come out of the June 20 meeting? Has the Walker had any more internal conversations about how to address the larger institutional issues Scaffold raised? With 50 years of artistic practice Jimmie Durham is regarded as one of the most important, globally-recognized artists working today. He is a multidisciplinary artist whose work includes sculpture, painting, drawing, performance, poetry and writing – influencing a generation of artists behind him. This long-awaited exhibition is his first solo show in the U.S. in over 20 years; it was organized by the Hammer Museum in Los Angeles and travels to the Walker, the Whitney in New York, and Remai Modern in Saskatoon. Comment: This email doesn’t respond to the question about the impact of last year’s meeting. It doesn’t respond to the question of what next steps might be. The email says the Walker has “long been aware of the issues and community concerns surrounding the artist [Durham] and his work.” Yet I am still unclear about what if anything the Walker did with this knowledge. According to Kessler’s email, it was only “following recent conversations” the Walker decided to add a note about the controversy to the exhibition text. That seems like a bare minimum response. The Walker’s response also seems cautious. The email said: “Throughout the exhibition period we are open to publishing and hosting discussions around Native sovereignty and identity issues.” The Walker doesn’t say it will host discussions, just that it is “open” to them. And why limit discussion around Native sovereignty and identity issues to just this exhibit? I sincerely hope that the happenings around the Scaffold piece and this exhibition create enough talk and examination that we could utilize these moments to genuinely move the dialogue forward…in the art world and beyond. It is my hope that the institutions involved boldly take on these important conversations. That they invite Native people to openly, honestly and whole-hardheartedly speak about their experiences and how such exhibitions (despite well-meaning intentions) actually support colonization. What could a conversation around Native identity look like at the Walker? I will offer a few nuggets from articles I’ve read. It could start with biography. 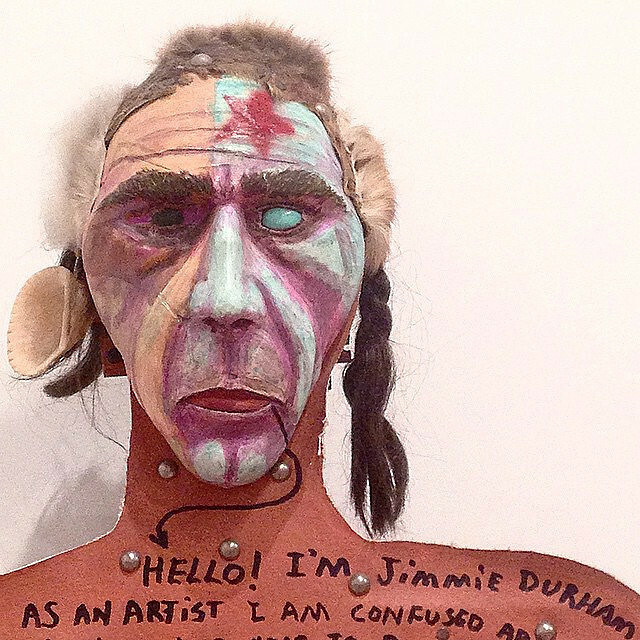 Durham is one-quarter Cherokee and grew up in a home speaking Cherokee, according to a story in HyperAllergic: Jimmie Durham Retrospective Reignites Debate Over His Claim of Native Ancestry. It affected his art, such as the self portrait at right. Further, Durham was deeply involved in the American Indian Movement here in the 1970s. According to a 2016 story in Indian Country Today, Durham worked as an AIM political organizer from 1973-1980, and was a member of AIM’s Central Council. However, Durham hasn’t been to the United States for more than 20 years. That “oppressive government system” could lead to conversations about U.S. “blood quantum laws“. These identified Native Americans by the percentage of Native American blood from their parents and ignored traditional ways that Native Americans identify themselves. An email exchange with a friend who is Dakota provided other insights about Native identity. Indian identity is a complicated thing. Indians do not define themselves solely as individuals but, instead, as members of families and communities whose personal identity is inextricably linked to others. Therefore, people come to be recognized for their talents through a collective process that requires observation and endorsement by multiple others over time, as well as dedication, patience and humility by the individual. The conversation could include how identity is fluid. For example, the U.S. Census is constantly changing how it allows people to self-identify by race. According to an L.A. Times review of the exhibit, Durham has tried to make light of state control of his identity, referring to himself as “a full-blooded contemporary artist” and a member of the tribe of sculptors. At the same time, the state did have control over Durham’s identity, specifically through the Indian Arts and Crafts Act (IACA) signed by President George H.W. Bush. The law imposed a five-year prison sentences plus fines up to $250,000 on people selling Indian art without being a certified tribal member, the Times story said. Returning to the Walker, perhaps the question is best phrased this way: What kind of identity does the Walker want to have in the community? How will it engage in these questions? … Walker programs examine the questions that shape and inspire us as individuals, cultures, and communities. The key question about the mission statement, then, is, how does the Walker define “us” and does “us” include Native Americans?